Shopsmith's easy-to-follow instructional materials will help you get started and guide you, every step of the way. The comprehensive 145-page Mark 7 owner's manual contains a wealth of invaluable information to help you get the most out of your Mark 7's seven basic functions. 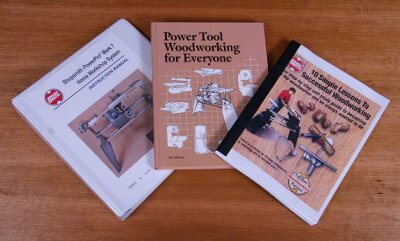 The Shopsmith Woodworking Self-Study Guide is an information-packed 10 lesson course. Beginners and experienced woodworkers alike will quickly find their own starting point, then advance at a chosen pace toward the level they want to achieve. Your Mark 7 also includes a 325-page Power Tool Woodworking For Everyone textbook with over 1,000 photos, diagrams and illustrations. Nearly 60 work-saving jigs and fixtures and hundreds of valuable woodworking tips and tricks-of-the-trade. At Shopsmith, we don't believe in selling you a Mark 7 and bidding you a fond farewell. We want to be your “Partner”... helping you achieve you woodworking goals by providing you a wealth of educational materials through our extensive internet website that's jam-packed with products, tips, techniques and project plans to help you become a better woodworker. We also offer easy, TOLL-FREE access to service and technical support from the comfort and convenience of your home shop phone.